With shades of The Hunger Games, Ender's Game, and Game of Thrones, debut author Pierce Brown's genre-defying epic Red Rising hit the ground running and wasted no time becoming a sensation. Golden Son continues the stunning saga of Darrow, a rebel forged by tragedy, battling to lead his oppressed people to freedom from the overlords of a brutal elitist future built on lies. Now fully embedded among the Gold ruling class, Darrow continues his work to bring down Society from within. I felt like the first book was a great epic story and this second book was really just a filler. it didn't quite grab my attention like the first book did. still loved it but not quite as good as the first. 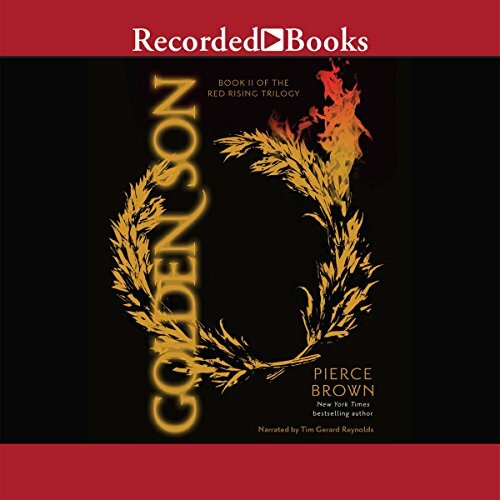 Where does Golden Son rank among all the audiobooks you’ve listened to so far? 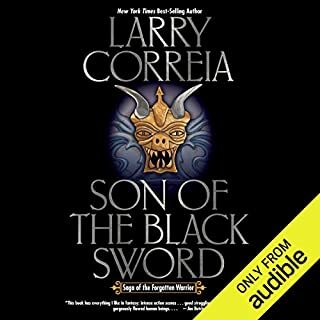 Golden Son is among the finest audiobooks I have ever read. My reading habits tend somewhat towards classics, and I am frequently disappointed by modern fare. I took a chance on Red RIsing, and couldn't get the characters out of my head when I finished. Golden Son is a greater achievement in every way when compared to its predecessor. The plot pulls the reader frantically from set piece to set piece as Darrow struggles with failure, guilt, disillusionment, and hope. The characters, introduced well in the first novel, become organic in this novel in a way I have not experienced in a novel since reading The Lord of the Rings Trilogy.While I was reading, I briefly forgot about the world outside as I was so invested. Roque, the warrior poet of the first novel, returns to this world in grand fashion. His continually deepening alienation with Darrow makes the reader compulsively question the state of that friendship even when reading about other characters. While the love story between Virginia and Darrow was compelling, it was practically an obligatory aspect of the novel. Roque's growth as a character was highly original. I had no idea what he would do until he acted. At the same time, I fully empathized with his situation and understood his motivations for his actions once he acted. He is a masterfully executed character. Ragnar was voiced wonderfully. While the character was essentially a replacement for Pax, the voice acting imbued his journey with dignity, grace, and magnificent resonance. However, each character was read well. I could not imagine simply reading a book like this. It must be experienced through audio. The ending. All I will say. 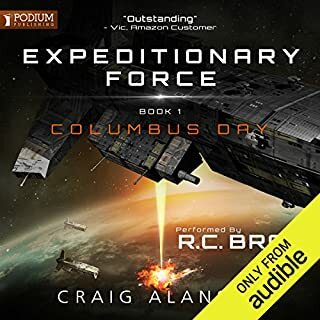 This is my first review on audible.com, as this is the first time I have felt so strongly about a book that I needed to share my opinion. It is a work that takes the best of current trends from novels like The Hunger Games and adds the power and philosophical complexity more commonly found in classical literature. Pierce Brown, if you are reading this, please take your time in completing the third book. This trilogy has the potential to truly endure once it comes to the public at large's attention, but a slapped together finale could easily destroy the world you have so carefully built. Exceeds the first in its brilliance--well worth the credit. It is books like this that create a void in their wake as I try to find something half as good (an experience that I love as I'm listening and hate as the book ends and i scrabble around for something else). I can count on one hand out of hundreds of series the times I have felt this way--and this is one of them. Other fingers listed below. I'm glad to add another series to my "I really can't stand the wait" list. Now if only someone could give me a list--like this--of books I've never read and they'd work for me as well as these! IS THIS A JOKE? DO YOU SEE US LAUGHING? At times I thought of The Gladiator, Outlander, Dune, Game of Thrones, and several fantasy epics. The book has a lot of good sparks to it and Brown is a very smart guy. The book has about everything, space battles, sword fights and lots of politics. The first two hours are excellent and did remind me of The Gladiator. Brown humiliates his main character, in what seems beyond repair. That was followed by two hours of inner strife. Than there is a really good sword fight. The next seven hours was mostly politics and conversations. Like most fantasy epics, there is a lot of talk about this family, that family, the histories of these families and the violence they did to each other and why they hate each other. I don't mind a little inner strife or even the history on certain houses, but not seven hours of it. If you stick with this occasionally something exciting will happen, you just might have to wait several hours. The politics got confusing and I had trouble figuring out who I was suppose to be for and who were the bad guys or why I should care. After twelve hours I lost patience and moved on to another book. The narrator is very good, he does a great Scottish accent. He did not have a huge range of voices and at times I was confused on who was speaking. I love the way this book flows and ends. My heart aches, my blood pumps, and the hair on my arms stands tall. Don’t get me wrong. I am RAVING about Red Rising to everyone I possibly can around the office. And if you haven’t picked up this series yet, you need to start at the beginning. But Golden Son is even better than the first book – which is such an unheard of rarity and a delightful surprise that I had to review this book first. I don’t want to give away any spoilers here, and it’s hard to say much without doing so, but I can say that this series is a total genre-bender: I’d call this “Post-apocalyptic-dystopian-YA-crossover-military-sci-fi-with-history-and-general-awesome-geniusness”. All these elements shimmer here and meld together into one whip-smart saga that stays with you for months after finishing it. Needless to say January (when the third and final book in Brown’s trilogy releases) can’t get here soon enough. You liked the first one? You'll like this one. If you could sum up Golden Son in three words, what would they be? Ragnar. His monologue near the end. What does Tim Gerard Reynolds bring to the story that you wouldn’t experience if you just read the book? Reynolds is well-known, his reading is gripping and his voice exceptional. It's worth the bloody damn credit. The theme of this book is "betrayal." Everyone is backstabbing everyone else. After the 3rd time, you'd think that it'd be over, but no. It just continues on the entire book. It becomes a game of "Who is going to backstab Darrow now?" You start to get numb to it by the end. Ulg. I don't want to go on to the next book because it's all so depressing. I can't believe there isn't more hype about this series!! I never ever write reviews, but this book truly merited one. I can't believe all the other YA tripe has been made into movies and not this series- this is so much better. The plot takes you for an awesome roller coaster ride- one you'll want to ride again and again. It's the perfect blend of love, loss, sadness, joy, humor and hope. It doesn't even have improbable "saved in the nick of time" situations that you can't suspend reality for. The narrator does and excellent job as well. No wonder this book has a 5 star rating! It's a sci-fi super blockbuster. More grown up than the Hunger Games but with the same pace and Jack Reacher as the principal character instead of a teenage girl. Don't read this until you have read Red Rising as it's quite a complicated scenario already and Golden Son moves at such a pace, you'll never catch up. The plot picks up with Darrow a couple of years after the events of Red Rising. He's doing pretty well for himself but it turns out he should have heeded the old adage about keeping your friends close and your enemies closer, so before too long, he is right back in the action which does not let up for a full 19 hours! Yes, some of the plot twists are a bit predictable and the characters are ludicrous but I can honestly say I've found this story absolutely irresistible, listening at almost any opportunity. It's good, clean fun and I'd recommend it to anyone who enjoys an all-action sci-fi fantasy story. Possibly some who don't too. Much less derivative than the first in the series and so a more interesting story. There's a lot of signposting of the way characters are going to develop but there are one or nice surprises. Being critical, there's a lot of a) plan for a fight, b) fight doesn't go to plan, c) miraculous event happens d) rinse and repeat which began to test my patience by the end. That said, I did marathon listen to this book and I will definitely get the third in the instalment. The narrator has eased off on the anti-British with bad guys having slightly less pronounced English accents in contrast to the humble underdogs' Irish brogue. Sadly, there's some butchering of some new accents here: the Scandinavian is painful to listen to. The plot twists are sublime, superb, memorising. Makes you cannot and will not want to stop the story. I listened the first book in two days and this one in another two days. Now straight onto the third book. i started with Red Rising on a recommendation. Complex, engaging and enormous fun. Brown, you have a reader for life. 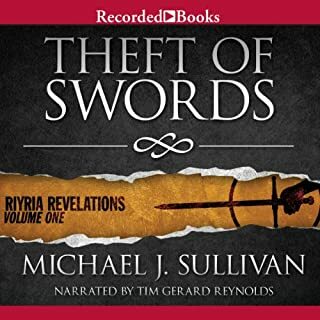 really enjoyed the series so far, narrated well, can't wait to get the next book. I'd struggle to pick my favourite book in this series, as they all excel in different ways, but I can not recommend enough buying and listening to this sequel. If you enjoyed the first book you'll love this one. This book finishes the trilogy in style. I really liked. The performance fro, Simon in the book is amazing. Looks like he was embedded in the book. Pierce is an author at the very top of his game. His handle on story, dialogue and pacing rivals that of George RR Martin. Golden Son is flawless in every possible way. It really got to me... moved me... made me invest emotionally in Darrow and his quest. I highly recommend it to anyone who appreciates quality writing and storytelling. A thoroughly enjoyable follow-up to the first book - I was captivated from start to finish. Moments of laughter and horror - what it does, it does well. a bloody damn great novel. Tim Gerard Reynolds as the narrator is perfect, and brings a lot to the story. Wonderful performance. Fairly cliche storyline and the market is saturated with the likes of these tales where from the suppressed classes rises a hero. In typical fashion they make friends with enemies and enemies of friends, fall in love and go through many a trial and tribulation. Just as they seem to reign it crumbles... I guess that's how marketing works and let me tell you this despite being cliches and nothing original- it's characters are well established its an easy listen and you can tell it'll be a blockbuster when released on the big screen. By the end you'll be downloading the next instalment , despite the tack purely because you need to know if good conquers evil, if love lifts you up, if the little guy gets his day in the sun , because the narrator isn't to hard on the ears, there's nothing to watch on tv and it's simple ! just as good as the first book! I was on the edge of my seat the whole time! straight on to book three i cannot stop. better then game of thrones better then harry potter! Well written and narrated beautifully. 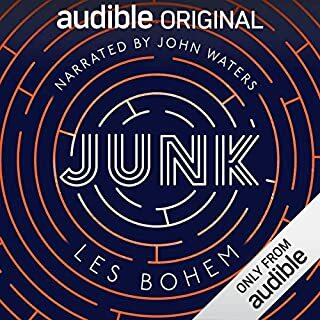 I absolutely devoured this audiobook. Both the writing and narration are excellent. Read Red Rising! loved it. Cant wait to go through the next book. Such a colourful storyline. Never a dull moment. I hope they make a good movie out of this! I really enjoyed this book, a bit predictable but it's got a compelling story, again the underdog against all odds and the occasional romance here and there, not the best book I have ever read, but good fun overall. This is an non stop action roller coaster! Even better than the first book Red Rising. I am looking forward to the next book in the series!